The Handley Page Victor is a British jet-powered strategic bomber, developed and produced by the Handley Page Aircraft Company, which served during the Cold War. It was the third and final V-bomber to be operated by the Royal Air Force (RAF), the other two being the Avro Vulcan and the Vickers Valiant. The Victor had been developed as part of the United Kingdom's airborne nuclear deterrent. In 1968, it was retired from the nuclear mission following the discovery of fatigue cracks, which had been exacerbated by the RAF's adoption of a low-altitude flight profile to avoid interception. A number of Victors were modified for strategic reconnaissance, using a combination of radar, cameras, and other sensors. As the nuclear deterrence mission was given to the Royal Navy's submarine-launched Polaris missiles in 1969, a large V-bomber fleet could not be justified. Consequently, many of the surviving Victors were converted into aerial refuelling tankers. During the Falklands War, Victor tankers were used in the airborne logistics operation to repeatedly refuel Vulcan bombers on their way to and from the Black Buck raids. The Victor was the last of the V-bombers to be retired, the final aircraft being removed from service on 15 October 1993. In its refuelling role, it was replaced by the Vickers VC10 and the Lockheed Tristar. The origin of the Victor and the other V bombers is heavily linked with the early British atomic weapons programme and nuclear deterrent policies that developed in the aftermath of the Second World War. The atom bomb programme formally began with Air Staff Operational Requirement OR.1001 issued in August 1946, which anticipated a government decision in January 1947 to authorise research and development work on atomic weapons, the U.S. Atomic Energy Act of 1946 (McMahon Act) having prohibited exporting atomic knowledge, even to countries that had collaborated on the Manhattan Project. OR.1001 envisaged a weapon not to exceed 24 ft 2 in (7.37 m) in length, 5 ft (1.5 m) in diameter, 10,000 lb (4,500 kg) in weight, and suitable for release from 20,000 ft (6,100 m) to 50,000 ft (15,000 m). At the same time, the Air Ministry drew up requirements for bombers to replace the existing piston-engined heavy bombers such as the Avro Lancaster and the new Avro Lincoln which equipped RAF Bomber Command. [N 1] In January 1947, the Ministry of Supply distributed Specification B.35/46 to aviation companies to satisfy Air Staff Operational Requirement OR.229 for "a medium range bomber landplane capable of carrying one 10,000 lb (4,500 kg) bomb to a target 1,500 nautical miles (1,700 mi; 2,800 km) from a base which may be anywhere in the world." A cruising speed of 500 knots (580 mph; 930 km/h) at heights between 35,000 ft (11,000 m) and 50,000 ft (15,000 m) was specified. The maximum weight when fully loaded ought not to exceed 100,000 lb (45,000 kg). The weapons load was to include a 10,000 lb "Special gravity bomb" (i.e. a free-fall nuclear weapon), or over shorter ranges 20,000 lb (9,100 kg) of conventional bombs. No defensive weapons were to be carried, the aircraft relying on its speed and altitude to avoid opposing fighters. The similar OR.230 required a "long range bomber" with a 2,000 nautical miles (2,300 mi; 3,700 km) radius of action at a height of 50,000 ft (15,000 m), a cruise speed of 575 mph (925 km/h), and a maximum weight of 200,000 lb (91,000 kg) when fully loaded. Responses to OR.230 were received from Short Brothers, Bristol, and Handley Page; however, the Air Ministry recognised that developing an aircraft to meet these stringent requirements would have been technically demanding and so expensive that the resulting bomber could only be purchased in small numbers. As a result, realising that the majority of likely targets would not require such a long range, a less demanding specification for a medium-range bomber, Air Ministry Specification B.35/46 was issued. This demanded the ability to carry the same 10,000 lb bomb-load to a target 1,500 nmi (1,725 mi, 2,800 km) away at a height of 45,000–50,000 ft (13,700–15,200 m) at a speed of 575 mph. The design proposed by Handley Page in response to B.35/46 was given the internal designation of HP.80. To achieve the required performance, Handley Page's aerodynamicist Dr. Gustav Lachmann and his deputy, Godfrey Lee developed a crescent-shaped swept wing for the HP.80. Aviation author Bill Gunston described the Victor's compound-sweep crescent wing as having been "undoubtedly the most efficient high-subsonic wing on any drawing board in 1947". The sweep and chord of the wing decreased in three distinct steps from the root to the tip, to ensure a constant critical Mach number across the entire wing and consequently a high cruise speed. The other parts of the aircraft which accelerate the flow, the nose and tail, were also designed for the same critical mach number so the shape of the HP.80 had a constant critical mach number all over. Early work on the project included tailless aircraft designs, which would have used wing-tip vertical surfaces instead; however as the proposal matured a high-mounted, full tailplane was adopted instead. The profile and shaping of the crescent wing was subject to considerable fine-tuning and alterations throughout the early development stages, particularly to counter unfavourable pitching behaviour in flight. The HP.80 and Avro's Type 698 were chosen as the best two of the proposed designs to B.35/46, and orders for two prototypes of each were placed. It was recognised, however, that there were many unknowns associated with both designs, and an order was also placed for Vickers' design, which became the Valiant. Although not fully meeting the requirements of the specification, the Valiant design posed little risk of failure and could therefore reach service earlier. The HP.80's crescent wing was tested on a ⅓-scale glider, the HP.87, and a heavily modified Supermarine Attacker, which was given the Handley Page HP.88 designation. The HP.88 crashed on 26 August 1951 after completing only about thirty flights and little useful data was gained during its brief two months of existence. By the time the HP.88 was ready, the HP.80 wing had changed such that the former was no longer representative. The design of the HP.80 had sufficiently advanced that the loss of the HP.88 had little effect on the programme. The prototypes performed well; however, design failings led to the loss of WB771 on 14 July 1954, when the tailplane detached whilst making a low-level pass over the runway at Cranfield, causing the aircraft to crash with the loss of the crew. Attached to the fin using three bolts, the tailplane was subjected to considerably more load than had been anticipated, causing fatigue cracking around the bolt holes. This led to the bolts loosening and failing in shear. Stress concentrations around the holes were reduced by adding a fourth bolt. The potential for flutter due to shortcomings in the design of the fin/tailplane joint was also reduced by shortening the fin. Additionally, the prototypes were tail heavy due to the lack of equipment in the nose; this was remedied by adding large ballast weights to the prototypes. Production Victors had a lengthened nose to move the crew escape door further from the engine intakes as the original position was considered too dangerous as an emergency exit in flight. The lengthened nose also improved the center of gravity range. Production B.1 Victors were powered by the Armstrong Siddeley Sapphire ASSa.7 turbojets rated at 11,000 lbf (49 kN), and was initially deployed with the Blue Danube nuclear weapon, re-deploying with the more powerful Yellow Sun weapon when it became available. Victors also carried U.S.-owned Mark 5 nuclear bombs (made available under the Project E programme) and the British Red Beard tactical nuclear weapon. A total of 24 were upgraded to B.1A standard by the addition of Red Steer tail warning radar in an enlarged tail-cone and a suite of radar warning receivers and electronic countermeasures (ECM) from 1958 to 1960. On 1 June 1956, a production Victor XA917 flown by test pilot Johnny Allam inadvertently exceeded the speed of sound after Allam let the nose drop slightly at a high power setting. Allam noticed a cockpit indication of Mach 1.1 and ground observers from Watford to Banbury reported hearing a sonic boom. The Victor maintained stability throughout the event. Aviation author Andrew Brookes has claimed that Allam broke the sound barrier knowingly to demonstrate the Victor's superiority to the earlier V-bombers. [N 3] The Victor was the largest aircraft to have broken the sound barrier at that time. The RAF required a higher ceiling for its bombers, and a number of proposals were considered for improved Victors to meet this demand. At first, Handley Page proposed use of the 14,000 lbf (62.4 kN) Sapphire 9 engines to produce a "Phase 2" bomber, to be followed by "Phase 3" Victors with much greater wingspan (137 ft (42 m)) and powered by Bristol Siddeley Olympus turbojets or Rolls-Royce Conway turbofans. 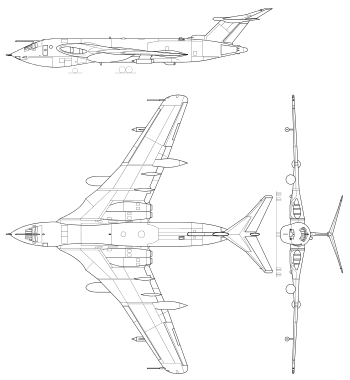 The Sapphire 9 was cancelled, however, and the heavily modified Phase 3 aircraft would have delayed production, so an interim "Phase 2A" Victor was proposed and accepted, to be powered by the Conway and having minimal modifications. The "Phase 2A" proposal was accepted by the Air Staff as the Victor B.2, with Conway RCo.11 engines providing 17,250 lbf (76.7 kN). The new Conway engines required redesigned enlarged intakes to provide the greater airflow required. The wingtips were extended, increasing the wingspan to 120 ft (36.6 m). The B.2 featured distinctive retractable "elephant ear" intakes not found on the B.1, located on the rear fuselage forward of the tail fin. These scoops fed ram air to Ram Air Turbines (RAT) which could provide electrical power during emergency situations, such as engine failure, during flight. The first prototype Victor B.2, serial number XH668 made its maiden flight on 20 February 1959. It had flown 100 hours by 20 August 1959, when, while high-altitude engine tests were being carried out by the Aeroplane and Armament Experimental Establishment (A&AEE), it disappeared from radar screens, crashing into the sea off the coast of Pembrokeshire. An extensive search operation was initiated to locate and salvage the wreckage of XH668 to determine the cause of the crash. It took until November 1960 to recover most of the aircraft; the accident investigation concluded that the starboard pitot head had failed inflight, causing the flight control system to force the aircraft into an unrecoverable dive. Only minor changes were needed to resolve this problem, allowing the Victor B.2 to enter service in February 1962. A total of 21 B.2 aircraft were upgraded to the B.2R standard with Conway RCo.17 engines (20,600 lbf or 92 kN thrust) and facilities to carry a Blue Steel stand-off nuclear missile. Their wings were modified to incorporate two "speed pods" or "Küchemann carrots". These were anti-shock bodies; bulged fairings that reduced wave drag at transonic speeds (see area rule), which were also used as a convenient place to house chaff dispensers. Handley Page proposed to build a further refined "Phase 6" Victor, with more fuel and capable of carrying up to four Skybolt (AGM-48) ballistic missiles on standing airborne patrols, but this proposal was rejected although it was agreed that some of the Victor B.2s on order would be fitted to carry two Skybolts. This plan was abandoned when the U.S. cancelled the whole Skybolt programme in 1963. With the move to low-level penetration missions, the Victors were fitted with air-to-air refuelling probes above the cockpit and received large underwing fuel tanks. Nine B.2 aircraft were converted for strategic reconnaissance purposes to replace Valiants which had been withdrawn due to wing fatigue, with delivery beginning in July 1965. These aircraft received a variety of cameras, a bomb bay-mounted radar mapping system and wing top sniffers to detect particles released from nuclear testing. Designated Victor SR.2, a single aircraft could photograph the whole of the United Kingdom in a single two-hour sortie. Different camera configurations could be installed in the bomb bay, including up to four F49 survey cameras and up to eight F96 cameras could be fitted to take vertical or oblique daylight photography; nighttime photography required the fitting of F89 cameras. The withdrawal of the Valiant fleet because of metal fatigue in December 1964 meant that the RAF had no front line tanker aircraft, so the B.1/1A aircraft, now judged to be surplus in the strategic bomber role, were refitted for this duty. To get some tankers into service as quickly as possible, six B.1A aircraft were converted to B(K).1A standard (later redesignated B.1A (K2P)), receiving a two-point system with a hose and drogue carried under each wing, while the bomb bay remained available for weapons. Handley Page worked day and night to convert these six aircraft, with the first being delivered on 28 April 1965, and 55 Squadron becoming operational in the tanker role in August 1965. While these six aircraft provided a limited tanker capability suitable for refuelling fighters, the Mk 20A wing hosereels could only deliver fuel at a limited rate, and were not suitable for refuelling bombers. Work therefore continued to produce a definitive three-point tanker conversion of the Victor Mk.1. Fourteen further B.1A and 11 B.1 were fitted with two permanently fitted fuel tanks in the bomb bay, and a high-capacity Mk 17 centreline hose dispenser unit with three times the fuel flow rate as the wing reels, and were designated K.1A and K.1 respectively. The remaining B.2 aircraft were not as suited to the low-level mission profile that the RAF had adopted for carrying out strategic bombing missions as the Vulcan with its strong delta wing. This, combined with the switch of the nuclear deterrent from the RAF to the Royal Navy (with the Polaris missile) meant that the Victors were considered to be surplus to requirements. Hence, 24 B.2 were modified to K.2 standard. Similar to the K.1/1A conversions, the wing was trimmed to reduce stress and the bomb aimer's nose glazing was plated over. During 1982, the glazing was reintroduced on some aircraft, the former nose bomb aimer's position having been used to mount F95 cameras in order to perform reconnaissance missions during the Falklands War. The K.2 could carry 91,000 lb (41,000 kg) of fuel. It served in the tanker role until withdrawn in October 1993. The Victor was a futuristic-looking, streamlined aircraft, with four turbojet (later turbofan) engines buried in the thick wing roots. Distinguishing features of the Victor were its highly swept T-tail with considerable dihedral on the tail planes, and a prominent chin bulge that contained the targeting radar, nose landing gear unit and an auxiliary bomb aimer's position. It was originally required by the specification that the whole nose section could be detached at high altitudes to act as an escape pod, but the Air Ministry abandoned this requirement in 1950. 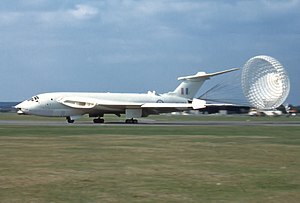 While assigned to the nuclear delivery role, the Victor was finished in an all-over anti-flash white colour scheme, designed to protect the aircraft against the damaging effects of a nuclear detonation. The white colour scheme was intended to reflect heat away from the aircraft; paler variations of RAF's roundels were also applied for this same reason. When the V-bombers were assigned to the low-level approach profile in the 1960s, the Victors were soon repainted in green/grey tactical camouflage to reduce visibility to ground observation; the same scheme was applied to subsequently converted tanker aircraft. The Victor's bomb bay was much larger than that of the Valiant and Vulcan, which allowed heavier weapon loads to be carried at the cost of range. As an alternative to the single "10,000 lb" nuclear bomb as required by the specification, the bomb bay was designed to carry several conventional armaments, including a single 22,000 lb (10,000 kg) Grand Slam or two 12,000 lb (5,500 kg) Tallboy earthquake bombs, up to forty-eight 1,000 lb (450 kg) bombs[N 5] or thirty-nine 2,000 lb (900 kg) sea mines. One proposed addition to the Victor were underwing panniers capable of carrying a further 28 1,000 lb bombs to supplement the main bomb bay, but this option was not pursued. In addition to a range of free-fall nuclear bombs, later Victor B.2s operated as missile carriers for standoff nuclear missiles such as Blue Steel; it had been intended for the American Skybolt missile to be introduced; however, development of Skybolt was cancelled. Target information for Blue Steel could be input during flight, as well in advance of the mission. It was reported that, with intensive work, a B.2 missile carrier could revert to carrying free-fall nuclear weapons or conventional munitions within 30 hours. Like the other two V-Bombers, the Victor made use of the Navigational and Bombing System (NBS); a little-used optical sight had also been installed upon early aircraft. For navigation and bomb-aiming purposes, the Victor employed several radar systems. These included the H2S radar, developed from the first airborne ground-scanning radar, and the Green Satin radar. Radar information was inputted into the onboard electromechanical analogue bomb-aiming apparatus. Some of the navigation and targeting equipment was either directly descended from, or shared concepts with, those used on Handley Page's preceding Halifax bomber. Operationally, the accuracy of the bomb-aiming system proved to be limited to roughly 400 yards, which was deemed sufficient for high-level nuclear strike operations. To evade enemy detection and interception efforts, the Victor was outfitted with an extensive electronic countermeasures (ECM) suite which were operated by the air electronics officer (AEO), who had primary responsibility for the aircraft's electronics and communication systems. The ECM equipment could be employed to disrupt effective use of both active and passive radar in the vicinity of the aircraft, and to provide situational awareness for the crew. Enemy communications could also be jammed, and radar guided missiles of the era were also reportedly rendered ineffective. The Victor B.2 featured an extended area located around the base of the tail fin which contained cooling systems and some of the ECM equipment. Some of the ECM equipment which initially saw use on the Victor, such as the original chaff dispenser and Orange Putter tail warning radar, had been developed for the earlier English Electric Canberra bomber and were already considered to be near-obsolete by the time the Victor had entered service. Significant improvements and alterations would be made to the avionics and ECM suites, as effective ECMs had been deemed critical to the Victor's role; for example, the introduction of the more capable Red Steer tail warning radar. The introduction of the Victor B.2 was accompanied by several new ECM systems, including a passive radar warning receiver, a metric radar jammer and communications jamming equipment. Streamlined fairings on the trailing edges of the wings that could house large quantities of defensive chaff/flares were also new additions. While trials were conducted with terrain-following radar and a side scan mode for the bombing and navigation radar, neither of these functions were integrated into the operational fleet. The Victor B.1 was powered by four Armstrong Siddeley Sapphire turbojet engines. The engines were embedded in pairs in the wing roots. Because of the high mounted position of the wing, the tail had to adopt a high mounting to maintain clearance of the jet turbulence, but the airbrakes were ideally situated to take advantage of this phenomenon. Difficulties were encountered with the Sapphires when stationed in tropical environments as several engines were destroyed by the turbine blades striking the outer engine casing, which could occur when flying through dense cloud or heavy rain. The Victor B.2 was powered by the newer Rolls-Royce Conway turbofan which at one point held the distinction of being the most powerful non-afterburning engine outside of the Soviet Union. The Conway had significantly higher thrust than the Sapphire engine in the B.1. The Victor B.2 featured a distinct change in the aircraft's engine arrangements; incorporated into the right wing root was a Blackburn Artouste airborne auxiliary power unit (AAPU), effectively a small fifth engine. The AAPU was capable of providing high-pressure air for starting the main engines, and also providing electrical power on the ground or alternatively in the air as an emergency back-up in the event of main engine failures. The AAPU also acted to reduce the need for external specialist support equipment. Turbine-driven alternators, otherwise known as ram air turbines (RATs), had been introduced on the B.2 to provide emergency power in the event of electrical or hydraulic power being lost. Retractable scoops in the rear fuselage would open to feed ram air into the RATs, which would provide sufficient electrical power to operate the flight controls. In the event of engine flameout RATs would assist the crew in maintaining control of the aircraft until the main engines could be relit. The Victor was commonly described as having good handling and excellent performance, along with favourable low speed flight characteristics. During the flight tests of the first prototype, the Victor proved its aerodynamic performance, flying up to Mach 0.98 without handling or buffeting problems; there were next to no aerodynamic changes between prototype and production aircraft. [N 7] Production aircraft featured an automated nose-flap operation to counteract a tendency for the aircraft to pitch upwards during low-to-moderate Mach numbers. At low altitude, the Victor typically flew in a smooth and comfortable manner, in part due to its narrowness and flexibility of the crescent wing. One unusual flight characteristic of the early Victor was its self-landing capability; once lined up with the runway, the aircraft would naturally flare as the wing entered into ground effect while the tail continued to sink, giving a cushioned landing without any command or intervention by the pilot. The Victor has been described as an agile aircraft, atypical for a large bomber aircraft; in 1958, a Victor had performed several loops and a barrel roll during practices for a display flight at Farnborough Airshow. Manoeuvrability was greatly enabled by the light controls, quick response of the aircraft, and the design of certain flight surfaces such as the infinitely-variable tail-mounted airbrake. The Victor was designed for flight at high subsonic speeds, although multiple instances have occurred in which the sound barrier was broken. During development of the Victor B.2, the RAF had stressed the concept of tactical manoeuvrability, which led to much effort in development being given to increasing the aircraft's height and range performance. Victor B.1 (XA922) on a landing approach, circa 1959. The Victor was the last of the V bombers to enter service, with deliveries of B.1s to No. 232 Operational Conversion Unit RAF based at RAF Gaydon, Warwickshire taking place in late 1957. The first operational bomber squadron, 10 Squadron, formed at RAF Cottesmore in April 1958, with a second squadron, 15 Squadron, forming before the end of the year. Four Victors, fitted with Yellow Astor reconnaissance radar, together with passive sensors, were used to equip a secretive unit, the Radar Reconnaissance Flight at RAF Wyton. The Victor bomber force continued to build up, with 57 Squadron forming in March 1959 and 55 Squadron in October 1960. At its height, the Victor was simultaneously operating with six squadrons of RAF Bomber Command. 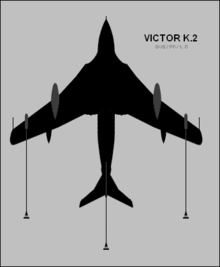 According to the operational doctrine developed by the RAF, in the circumstance of deploying a large-scale nuclear strike, each Victor would have operated entirely independently; the crews would conduct their mission without external guidance and be reliant upon the effectiveness of their individual tactics to reach and successfully attack their assigned target; thus great emphasis was placed on continuous crew training during peacetime. Developing a sense of a crew unity was considered highly important; Victor crews would typically serve together for at least five years, and a similar approach was adopted with ground personnel. In order to maximise the operational lifespan of each aircraft, Victor crews typically flew a single five-hour training mission per week. Each crew member was required to qualify for servicing certificates to independently undertake inspection, refuelling and turnaround operations. In times of high international tension, the V-bombers would be dispersed and have been maintained at a high state of readiness; if the order was given to deploy a nuclear strike, Victors at high readiness would have been airborne in under four minutes from the point the order had been issued. British intelligence had estimated that the Soviets' radar network was capable of detecting the Victor at up to 200 miles away, so to avoid interception, the Victor would follow carefully planned routes to exploit weaknesses in the Soviet detection network. This tactic was employed in conjunction with the Victor's extensive onboard electronic countermeasures (ECM) to increase the chances of evasion. Whilst originally the Victor would have maintained high-altitude flight throughout a nuclear strike mission, rapid advances of the Soviet anti-aircraft warfare capabilities (exemplified by the downing of a U2 from 70,000 ft in 1960) led to this tactic being abandoned: a low-level high-speed approach supported by increasingly sophisticated ECMs was adopted in its place. The improved Victor B.2 started to be delivered in 1961, with the first B.2 Squadron, 139 Squadron, forming in February 1962, and a second, 100 Squadron, in May 1962. These were the only two bomber squadrons to form on the B.2, as the last 28 Victors on order were cancelled. The prospect of Skybolt ballistic missiles, with which each V-bomber could strike at two separate targets, meant that fewer bombers would be needed, while the government was unhappy with Sir Frederick Handley Page's resistance to their pressure to merge his company with competitors. While Skybolt's development would be terminated, Victor B.2s were retrofitted as carrier aircraft for the Blue Steel standoff nuclear missile. The introduction of standoff weapons and the switch to low-level flight in order to evade radar detection were said to be decisive factors in the successful penetration of enemy territory. In 1964–1965, a series of detachments of Victor B.1As was deployed to RAF Tengah, Singapore as a deterrent against Indonesia during the Borneo conflict, the detachments fulfilling a strategic deterrent role as part of Far East Air Force, while also giving valuable training in low-level flight and visual bombing. In September 1964, with the confrontation with Indonesia reaching a peak, the detachment of four Victors was prepared for rapid dispersal, with two aircraft loaded with live conventional bombs and held on one-hour readiness, ready to fly operational sorties. However, they were never required to fly combat missions and the high readiness alert finished at the end of the month. Following the discovery of fatigue cracks, developing due to their low-altitude usage, the B.2R strategic bombers were retired and placed in storage by the end of 1968. The RAF had experienced intense demand on its existing aerial refuelling tanker fleet, and its existing fleet of Victor B.1 tankers that had been converted earlier were due to be retired in the 1970s, so it was decided that the stored Victor B.2Rs would be converted to tankers also. Handley Page prepared a modification scheme that would see the Victors fitted with tip tanks, the structure modified to limit further fatigue cracking in the wings, and ejection seats provided for all six crewmembers. The Ministry of Defence delayed signing the order for conversion of the B2s until after Handley Page went into liquidation. The contract for conversion was instead awarded to Hawker Siddeley, who produced a much simpler conversion than that planned by Handley Page, with the wingspan shortened to reduce wing bending stress and hence extend airframe life. While the Victor was never permanently based with any units stationed overseas, temporary deployments were frequently conducted, often in a ceremonial capacity or to participate in training exercises and competitions. Victor squadrons were dispatched on several extended deployments to the Far East, and short term deployments to Canada were also conducted for training purposes. At one point during the early 1960s, South Africa showed considerable interest in the acquisition of several bomber-configured Victors; in the end, the Victor did not serve with any operator other than the RAF. Several of the Victor B.2s had been converted for Strategic Reconnaissance missions following the retirement of the Valiant in this capacity. In service, this type was primarily used in surveillance of the Atlantic and Mediterranean Seas, capable of surveying 400,000 square miles in an eight-hour mission; they were also used to sample the fallout from French nuclear tests conducted in the South Pacific. Originally reconnaissance Victors were equipped for visual reconnaissance; it was found to be cheaper to assign Canberra light bombers to this duty and the cameras were removed in 1970. Subsequently, radar-based reconnaissance was emphasised in the type's role. The reconnaissance Victors remained in use until 1974 when they followed the standard bombers into the tanker conversion line; a handful of modified Avro Vulcans assumed the maritime radar reconnaissance role in their place. Two of the V-bombers, the Victor and the Vulcan, played a high-profile role during the 1982 Falklands War. In order to cross the vast distance of the Atlantic Ocean, a single Vulcan required refuelling several times from Victor tankers. A total of three bombing missions were flown against Argentine forces deployed to the Falklands, with approximately 1.1 million gal (5 million L) of fuel consumed in each mission. At the time, these missions held the record for the world's longest-distance bombing raids. The deployment of other assets to the theatre, such as the Hawker Siddeley Nimrod and Lockheed Hercules, required the support of the Victor tanker fleet, which had been temporarily relocated to RAF Ascension Island for the campaign. The Victor also undertook several reconnaissance missions over the South Atlantic. These missions provided valuable intelligence for the retaking of South Georgia by British forces. Following the invasion of Kuwait by neighbouring Iraq in 1991, a total of eight Victor K.2s were deployed to Bahrain to provide in-flight refuelling support to RAF and other coalition aircraft during the subsequent 1991 Gulf War. RAF strike aircraft such as the Panavia Tornado would frequently make use of the tanker to refuel prior to launching cross-border strikes inside Iraq. Shortly after the Gulf War, the remaining Victor fleet was quickly retired in 1993, at which point it had been the last of the three V-bombers in operational service; retiring nine years after the last Vulcan, although the Vulcan had survived longer in its original role as a bomber. Strategic bomber aircraft, 50 built. Strategic bomber aircraft, B.1 updated with Red Steer tail warning radar and ECM suite, 24 converted. 2 point in-flight refuelling tanker retaining bomber capability, six converted. 3 point in-flight refuelling tanker (renamed K.1 after bombing capability removed), 11 converted. 3 point in-flight refuelling tanker (renamed K.1A as for K.1), 14 converted. Strategic bomber aircraft, 34 built. Blue Steel-capable aircraft with RCo.17 Conway 201 engines, 21 converted. Strategic reconnaissance aircraft, nine converted. In-flight refuelling tanker. 24 converted from B.2 and B(SR).2. Proposed military transport of 1950 with new fuselage carrying 85 troops. Unbuilt. 1950 civil airliner project. Not built. Proposed pathfinder version with remotely operated tail guns and powered by Conway engines. Rejected in favour of Valiant B.2. Proposed military transport version of HP.97. Not built. Proposed "Phase 3" bomber of 1955 powered by Bristol Olympus or Sapphire engines. Not built. 1958 project for military or civil transport, powered by four Conway engines. Capacity for 200 troops in military version or 145 passengers in airliner in a double-decker fuselage. Proposed "Phase 6" bomber designed for standing patrols carrying two or four GAM-87 Skybolt ballistic missiles. Proposed military tactical transport based on HP.111 and fitted with blown flaps. Rejected in favour of Armstrong Whitworth AW.681. No. 10 Squadron RAF operated B.1 from April 1958 to March 1964 at RAF Cottesmore. No. 15 Squadron RAF operated B.1 from September 1958 to October 1964 at RAF Cottesmore. No. 55 Squadron RAF operated B.1 and B.1As from RAF Honington from October 1960, moving to RAF Marham and receiving B.1(K)A tankers in May 1965. These were replaced by K.2 in July 1975, with the squadron continuing to operate Victors in the tanker role until disbanding in October 1993. No. 57 Squadron RAF operated B.1As from RAF Honington from March 1959, moving to RAF Marham in December 1965 for conversion to K.1 and later K.2 tankers until disbanding in June 1986. No. 100 Squadron RAF operated B.2s at RAF Wittering from May 1962 to September 1968. No. 139 (Jamaica) Squadron RAF operated B.2s from RAF Wittering from February 1962 to December 1968. No. 214 Squadron RAF operated K.1 tankers from RAF Marham from July 1966 to January 1977. No. 543 Squadron RAF operated B(SR).2s from RAF Wyton from December 1965 to May 1974. No. 232 Operational Conversion Unit RAF. Radar Reconnaissance Flight RAF Wyton. 14 July 1954: WB771 the prototype HP.80 crashed during a test flight at Cranfield, England. All four crewmen died. The tailplane became detached from the top of the fin. 16 April 1958: XA921 a B.1 undertaking Ministry of Supply trials experienced a collapse of the rear bomb bay bulkhead while cycling the bomb bay doors, damaging hydraulic and electrical systems; the aircraft successfully returned to base. Following the incident, in-service Victors had restrictions put in place on the opening of the bomb doors until Modification 943 was applied to all aircraft. 20 August 1959: XH668 a B2 of the A&AEE lost a pitot head and dived into the sea off Milford Haven, Pembrokeshire. 19 June 1960: XH617 a B1A of 57 Squadron caught fire in the air and was abandoned near Diss, Norfolk. 23 March 1962: XL159 a B2 of the A&AEE stalled and dived into a house at Stubton, Lincolnshire. 14 June 1962: XH613 a B1A of 15 Squadron lost power on all engines and was abandoned on approach to RAF Cottesmore. 16 June 1962: XA929 a B1 of 10 Squadron overshot the runway and broke up at RAF Akrotiri following an aborted takeoff. 2 October 1962: XA934 a B1 of 'A' Squadron, 232 OCU had an engine failure and deliberate shutdown of the adjacent engine on takeoff from RAF Gaydon. During the approach to land the other two engines flamed out. The aircraft crashed into a copse several miles from RAF Gaydon. Of the four crew on board only the co-pilot survived. The RAF accident record states the prime cause as mis-management of the fuel system and consequent fuel starvation of the two running engines. 20 March 1963: XM714 a B2 of 100 Squadron stalled after takeoff from RAF Wittering. 29 June 1966: XM716 a SR2 of 543 Squadron was giving a demonstration flight for the press and television at RAF Wyton. The aircraft had made one high-speed circuit and was flying low in a wide arc to return over the airfield when the starboard wing was seen to break away and both it and the rest of the aircraft burst into flames. All four crew were killed. The aircraft was the first SR2 to enter service with the squadron. The aircraft had exceeded its operational limitations causing overstressing. 10 May 1973: XL230 a SR2 of 543 Squadron bounced during landing at RAF Wyton and exploded. 24 March 1975: Victor K1A XH618 of 57 Squadron was involved in a midair collision with Hawker Siddeley Buccaneer XV156 during a simulated refuelling. The Buccaneer hit the Victor's tailplane causing the Victor to crash into the sea 95 mi (153 km) east of Sunderland, Tyne and Wear, four crew killed. 29 Sept 1976: XL513 a K2 of No 55 Squadron aborted take off and overshot the runway at RAF Marham after a bird strike. The crew escaped with no serious injuries. The aircraft caught fire and was damaged beyond repair. 15 October 1982: XL232 a K2 of No 55 Squadron suffered an uncontained turbine failure early in the take off run. The aircraft was stopped and the crew evacuated the aircraft with no injuries. Debris from the turbine penetrated a fuselage fuel tank, starting an uncontrolled fire, destroying the aircraft and damaging the runway at RAF Marham. 19 June 1986: XL191 a K2 of 57 Squadron undershot approach in bad weather at Hamilton, Ontario. 3 May 2009: During a "fast taxi" run at Bruntingthorpe Aerodrome, XM715 made an unplanned brief flight, reaching a height of about 30 ft (9 m) at maximum. The aircraft did not have a permit to fly; however, the Civil Aviation Authority (CAA) stated that they would not be conducting an investigation. The co-pilot had failed to reply to the command "throttles back"; the pilot then had to control the throttles himself, the confusion temporarily disrupting firm control of the aircraft. A total of five Victors have survived and are on display in the United Kingdom. None are flightworthy as of 2013. Victor B.1A XH648: a B.1A (K.2P) at the Imperial War Museum Duxford, Cambridgeshire. This is the sole B.1 to survive. Victor K.2 XH672: Maid Marian, at the Royal Air Force Museum, Cosford, Shropshire, in the National Cold War Exhibition. Victor K.2 XH673: Gate guardian at RAF Marham, Norfolk, the Victor's last home. Victor K.2 XL231: Lusty Lindy, at the Yorkshire Air Museum, York. The prototype for the B.2 to K.2 conversion. XL231 is one of two Victors currently in taxiable condition. Victor K.2 XM715: Teasin' Tina/Victor Meldrew, at the British Aviation Heritage Centre, Bruntingthorpe, Leicestershire. XM715 is also one of two Victors currently in taxiable condition. A 1964 Gerhard Richter painting titled XL 513 depicts Victor K.2, which was lost in a 1976 accident at RAF Marham. ^ Frederick Handley Page, the founder and owner of Handley Page, had anticipated that there would be a need to replace the Lincoln bomber well in advance of any requirement, having issued a memo on 14 June 1945 requesting the immediate investigation of two new bomber designs. ^ According to aviation author Jon Lake, the name 'Victor' had originated from British Prime Minister Winston Churchill. ^ Paul Langston, an observer on-board while XA917 broke the sound barrier, has the distinction of being the first man to break the sound barrier seated backwards. 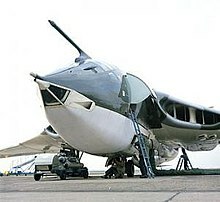 ^ Martin Baker developed and tested rearward ejection systems for both the Valiant and the Vulcan, proceeding to the point of a modified Valiant undergoing testing; however the company concluded that the same approach on the Victor would be substantially more difficult due to structural reasons. ^ In operational service with the RAF, a maximum payload of 35 1,000 lb bombs could be carried. ^ Godfrey Lee, one of the aircraft's designers, stated of the electrical changes that "an unbelievable improvement followed from going over from DC to AC". ^ Hedley Hazelden, Handley Page's chief test pilot, stated that "From a pilot's point of view, the Victor wasn't that much of a problem. In spite of innovations such as powered controls and nose flaps, it flew like any other aeroplane". ^ Sidney, William. "Supply of Aircraft (Hansard, 17 February 1953)". millbanksystems. Hansard. Retrieved 30 May 2016. ^ Wynn 1997, pp. 7, 16. ^ Wynn 1997, p. 18. ^ Brookes 2011, p. 6. ^ a b Buttler Air Enthusiast January/February 1999, pp. 28–31. ^ Wynn 1997, pp. 44–46. ^ Butler and Buttler 2009, p. 7. ^ Brookes 2011, pp. 6–7. ^ Lee, G.H. "Aerodynamics of the Crescent Wing." Flight, 14 May 1954, pp. 611–612. ^ Flight 30 October 1959, p. 463. ^ Butler and Buttler 2009, p. 9. ^ a b Lake 2002, p. 364. ^ Buttler Air Enthusiast January/February 1999, pp. 38–39. ^ Donald 2008, pp. 127–128. ^ Barnes 1976, p. 502. ^ Barnes 1976, p. 503. ^ "This British Bomber Leads The World." The Age, 15 January 1953. p. 2. ^ Brookes 2011, p. 9. ^ Brooks The Handley Page Victor: Volume 1 2007, p. 114. ^ Barnes 1976, p. 506. ^ Gunston Aeroplane Monthly February 1981, p. 61. ^ Darling 2012, p. 49. ^ Gunston Aeroplane Monthly February 1981, pp. 61–62. ^ a b c Mason 1994, p. 388. ^ Brookes 2011, p. 29. ^ Leitch Air Enthusiast September/October 2003, pp. 55, 58. ^ a b c d e "Handley page Victor K.2". Gatwick Aviation Museum. Archived from the original on 15 May 2011. Retrieved 12 April 2011. ^ a b Gunston Aeroplane Monthly February 1981, p. 63. ^ a b Brookes 2011, p. 10. ^ Gunston Aeroplane Monthly February 1981, p. 62. ^ Barnes 1976, pp. 509–511. ^ Darling 2012, p. 50. ^ ap Rees Air Pictorial June 1972, p. 220. ^ a b Fraser-Mitchell 2009, pp. 86–87. ^ a b c Flight 30 October 1959, p. 472. ^ Barnes 1976, p. 514. ^ Middleton Air Enthusiast Winter 1993, pp. 70–71. ^ Barnes 1976, p. 516. ^ a b Barnes 1976, pp. 519–520. ^ Mason 1994, pp. 388–389. ^ ap Rees Air Pictorial June 1972, p. 222. ^ a b Barnes 1976, p. 518. ^ Rodwell Flight 13 February 1964, p. 241. ^ Darling 2012, pp. 52–53. ^ a b c d e f g h i j k l m n o p q r s t Mason 1994, p. 389. ^ a b Gunston Aeroplane Monthly February 1981, pp. 64–65. ^ Darling 2012, p. 53. ^ Darling 2012, pp. 162–163. ^ a b Flight 19 September 1958, p. 495. ^ ap Rees Air Pictorial May 1972, p. 166. ^ Gunston Aeroplane Monthly January 1981, pp. 6–7. ^ Flight 19 September 1958, pp. 494–495. ^ Gunston Aeroplane Monthly January 1981, p. 9. ^ "The V-Bomber Ejector Seat Story." BBC. Retrieved: 27 September 2010. ^ Hamilton-Paterson 2010, p. 156. ^ Butler and Buttler 2009, pp. 38–39. ^ Barnes 1976, p. 508. ^ a b Rodwell Flight 13 February 1964, pp. 241–242. ^ Rodwell Flight 13 February 1964, p. 245. ^ a b c Butler and Buttler 2009, p. 61. ^ Butler and Buttler 2009, p. 40. ^ Brookes 2011, p. 21. ^ Butler and Buttler 2009, p. 44. ^ Brookes 2011, p. 13. ^ a b Brookes 2011, p. 24. ^ Barnes 1976, p. 519. ^ Butler and Buttler 2009, p. 39. ^ Butler and Buttler 2009, p. 39-40. ^ Butler and Buttler 2009, pp. 44, 47. ^ Flight 30 October 1959, pp. 463–465. ^ Flight 30 October 1959, pp. 463–466. ^ Butler and Buttler 2009, p. 60. ^ Butler and Buttler 2009, p. 31. ^ a b Brookes 2011, p. 18. ^ Butler and Buttler 2009, p. 33. ^ Hamilton-Paterson 2010, p. 112. ^ Butler and Buttler 2009, p. 29. ^ Butler and Buttler 2009, p. 35. ^ "Farnborough Week: The most Memorable S.B.A.C. Display Yet." Flight International, 12 September 1958. pp. 438, 442. ^ Butler and Buttler 2009, p. 32. ^ Butler and Buttler 2009, pp. 33–34. ^ Butler and Buttler 2009, pp. 60–61. ^ a b c Mason 1994, p. 387. ^ a b Gunston Aeroplane Monthly February 1981, pp. 62–63. ^ Butler and Buttler 2009, p. 63. ^ Flight 19 September 1958, p. 493. ^ Flight 19 September 1958, pp. 493–495. ^ Flight 19 September 1958, p. 494. ^ Brookes 2011, pp. 23–24. ^ Butler and Buttler 2009, p. 49. ^ Windle and Bowman 2009, p. 21. ^ Barnes 1976, pp. 518–519. ^ a b c Lake 2002, p. 369. ^ a b c Barnes 1976, p. 527. ^ Rodwell Flight 6 May 1965, p. 703. ^ Brookes 2011, p. 65. ^ Darling 2012, pp. 110–111. ^ Barnes 1976, p. 526. ^ Fraser-Mitchell 2009, pp. 88–89. ^ Fraser-Mitchell 2009, pp. 90–91. ^ Butler and Buttler 2009, pp. 72, 75. ^ Butler and Buttler 2009, p. 75. ^ Butler and Buttler 2009, p. 72. ^ Brookes 2011, p. 69. ^ "The Falkland Islands: A history of the 1982 conflict." Royal Air Force, 29 April 2010. ^ "Operation Black Buck." Royal Air Force, Retrieved: 20 April 2014. ^ Bull 2004, p. 84. ^ Thompson, Julian. "Falklands Conflict Gallery." BBC, June 2007. ^ "Narrative of RAF Contribution to the Falklands Campaign." The National Archives, Retrieved: 20 April 2014. ^ Darling 2012, pp. 162–165. ^ "RAF Aircraft in Operation Granby." Royal Air Force, Retrieved: 20 April 2014. ^ Brookes 2011, pp. 90–91. ^ Brookes and Davy 2011, pp. 14–15. ^ a b c d "Handley Page Victor K2". Royal Air Force Museum, 2010. Retrieved 12 April 2011. ^ a b Barnes 1976, p. 498. ^ Barnes 1976, p. 501. ^ Barnes 1976, p. 605. ^ Barnes 1976, pp. 527–529. ^ a b Barnes 1976, p. 529. ^ Gunston Aeroplane Monthly February 1981, p. 65. ^ Ashworth 1989, p. 131. ^ Brookes 2011, pp. 75, 92. ^ Darling 2012, p. 55. ^ a b c d e Halley 2001, p. 42. ^ a b c Halley 2001, p. 54. ^ a b Halley 2001, p. 9. ^ Halley 2001, p. 64. ^ a b c "A Victor 2 Falls In Flames Four killed in display run." The Times, Issue 56671, 30 June 1966, p. 1, Column G.
^ a b "Handley Page Victor". Ejection History. Retrieved 12 April 2011. ^ Barnes 1976, p. 525. ^ "UK Military Aircraft Losses: 1968". ukserials.com. Wolverhampton Aviation Group. Retrieved 19 April 2011. ^ "Pictures: Victor bomber accidentally becomes airborne during taxi demo." Flight International, 9 September 2009. Retrieved: 24 July 2010. ^ "Hero pilot, 70, averted air show disaster after co-pilot hit throttle of giant bomber by mistake." Daily Mail, 9 September 2009. Retrieved: 24 July 2010. ^ "Probe into unauthorised Victor flight." Archived 27 September 2009 at WebCite Leicester Mercury, 9 September 2009. Retrieved: 24 July 2010. ^ "Victor test flight." YouTube video. Retrieved: 25 July 2010. ^ "Concorde will never fly again, says Vulcan restoration expert" Institute of Mechanical Engineers, 28 June 2013. ^ "Handley Page Victor." Imperial War Museum Duxford via The National Archive, Retrieved: 20 April 2014. ^ Simpson, Andrew. "Individual History: Handley Page Victor K.2 XH672/9242M: Museum Accession Number 1995/1001/A". Royal Air Force Museum Cosford. Retrieved 12 April 2011. ^ Thunder & Lightnings (2 October 2008). "Survivor XH673". Thunder & Lightnings. Retrieved 12 April 2011. ^ The Victor Association. "XL 231 Lindy Updates". The Victor Association. Archived from the original on 8 February 2012. Retrieved 12 April 2011. ^ Thunder & Lightnings (25 May 2010). "Survivor XM715". Thunder & Lightnings. Retrieved 12 April 2011. ^ Fraser-Mitchell 2009, p. 86.
ap Rees, Elfan. "Handley Page Victor: Part 1". Air Pictorial, May 1972, Vol. 34, No 5., pp. 162–167. ap Rees, Elfan. "Handley Page Victor: Part 2". Air Pictorial, June 1972, Vol. 34, No 6., pp. 220–226. Ashworth, Chris. Encyclopaedia of Modern Royal Air Force Squadrons. Wellingborough, UK: Patrick Stephens Limited, 1989. ISBN 1-85260-013-6. Barnes, C.H. Handley Page Aircraft since 1907. London: Putnam, 1976. ISBN 0-370-00030-7. Butler, Phil and Tony Buttler. 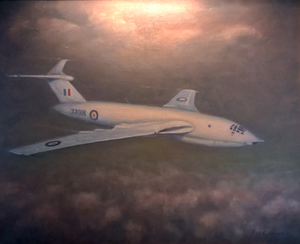 Aerofax: Handley-Page Victor. Midland Publishing, 2009. ISBN 1-85780-311-6. Brookes, Andrew. Victor Units of the Cold War. Osprey Publishing, 2011. ISBN 1-84908-339-8. Brooks, Roger R. The Handley Page Victor: The History & Development of a Classic Jet: Volume 1 The HP80 Prototype & The Mark I, Barnsley, UK: Pen & Sword Aviation, 2007, ISBN 978 1 84415 411 1. Darling, Kev. RAF Strike Command 1968 -2007: Aircraft, Men and Action. Casemate Publishers, 2012. ISBN 1-84884-898-6. Donald, David. "Warplane Classic: Handley Page Victor." International Airpower Review, Issue 25, 2008, pp. 124–153. Westport, CT: AIRtime Publishing. ISSN 1473-9917. Fraser-Mitchell, Harry. "Database: Handley Page Victor". Aeroplane, Vol. 37, No. 7, July 2009, pp. 73–94. ISSN 0143-7240. Gunston, Bill. Bombers of the West. London: Ian Allan, 1973, pp. 78–102. ISBN 0-7110-0456-0. Gunston, Bill. "The V-Bombers: Handley Page Victor—Part 1". Aeroplane Monthly, Vol. 9, No 1, January 1981, pp. 4–9. ISSN 0143-7240. Gunston, Bill. "The V-Bombers: Handley Page Victor—Part 2". Aeroplane Monthly, Vol. 9, No 2, February 1981, pp. 60–65. ISSN 0143-7240. Gunston, Bill. "The V-Bombers: Handley Page Victor—Part 3". Aeroplane Monthly, Vol. 9, No 3, March 1981, pp. 136–139, 142–146. ISSN 0143-7240. Halley, James. Royal Air Force Aircraft XA100 to XZ999. Tonbridge, Kent, UK: Air-Britain (Historians) Ltd., 2001. ISBN 0-85130-311-0. Hamilton-Paterson, James. Empire of the Clouds: When Britain's Aircraft Ruled the World. Faber & Faber, 2010. ISBN 0-57127-173-1. Lake, Jon. The Great Book of Bombers: The World's Most Important Bombers from World War I to the Present Day. Zenith Imprint, 2002. ISBN 0-7603-1347-4. Leich, Andy. "V Force Nuclear Arsenal: Weapons for the Valiant, Victor and Vulcan". Air Enthusiast, No. 107, September/October 2003, pp. 52–59. ISSN 0143-5450. Middleton, Don. "Testing the Victor". Air Enthusiast, Fifty-Two, Winter 1993. pp. 60–75. ISSN 0143-5450. "Parade of Victors: No. 10 Squadron at RAF Cottesmore". Flight, 19 September 1958, pp. 493–496. Rodwell, Robert R. "Lo-Hi Victor: Mixed Mission over Malaya". Flight, 6 May 1965. pp. 700–703. Rodwell, Robert R. "The Steel in the Blue: Last Week's Glimpse of the V-force". Flight, 13 February 1964, pp. 241–245. "Victor: A Technical Description of Britain's Latest V-Bomber." Flight, 30 October 1959, pp. 463–472. Windle, Dave and Martin Bowman. V Bombers: Vulcan, Valiant and Victor, Casemate Publishers, 2009. ISBN 1-84415-827-6. Wynn, Humphrey. RAF Strategic Nuclear Deterrent Forces: Origins, Roles and Deployment 1946–1969. London: The Stationery Office, 1997. ISBN 0-11-772833-0. Wikimedia Commons has media related to Handley Page Victor. Victor information from "Thunder and Lightnings"
The Handley Page Victor at Greg Goebel's "In The Public Domain"